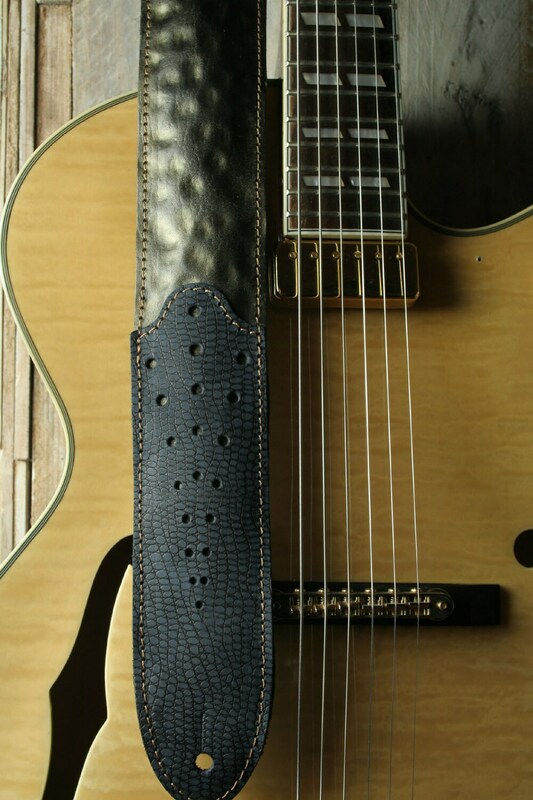 The Pinegrove GS77 is a premium leather guitar strap. 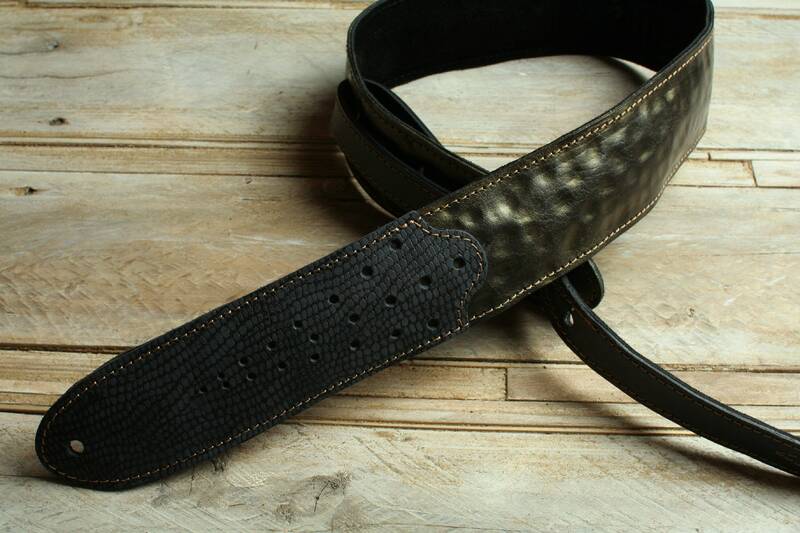 This is a fully padded guitar strap with a thick cow-suede backing, so giving you great comfort and feel. The black and gold hammered effect is created using 9-stage process of debossing, dyeing and polishing over real vegetable-tanned natural cowhide. 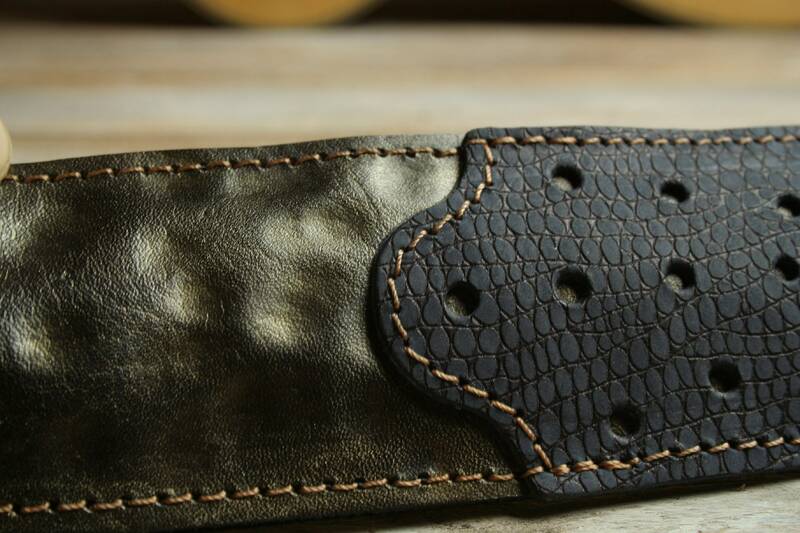 The black end cover is tough cowhide embossed with a snakeskin pattern. 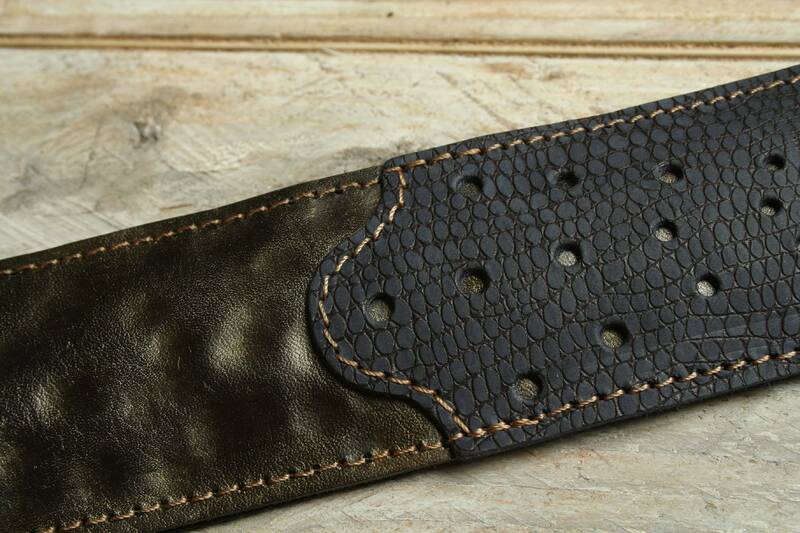 Strap design is an original from the Pinegrove Leather workshop, guaranteed to give you wow factor on stage. 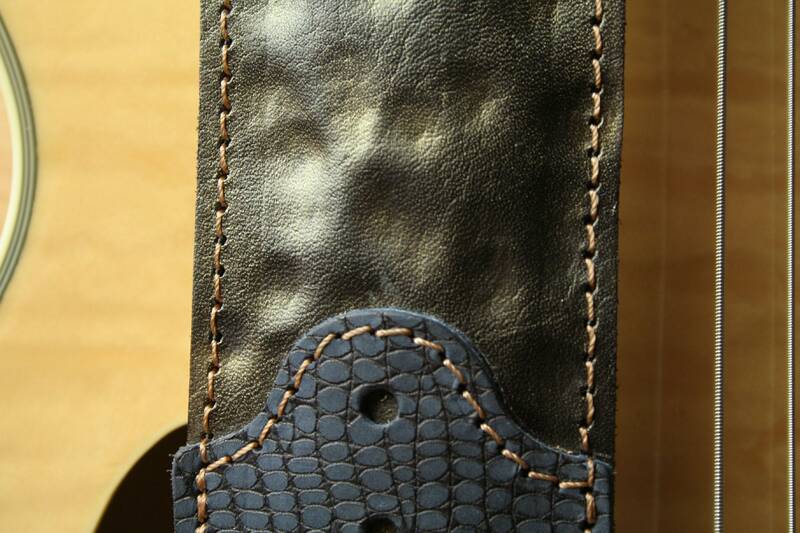 This guitar strap is 2 3/8" wide (a full 60mm). It has a standard interweave adjustment tailpiece with 9 slots, giving a long adjustment range from 38" to 52" (96 to 132cm). Message us if you require a longer or shorter strap. The pin holes are a standard 8mm (3/8") wide. 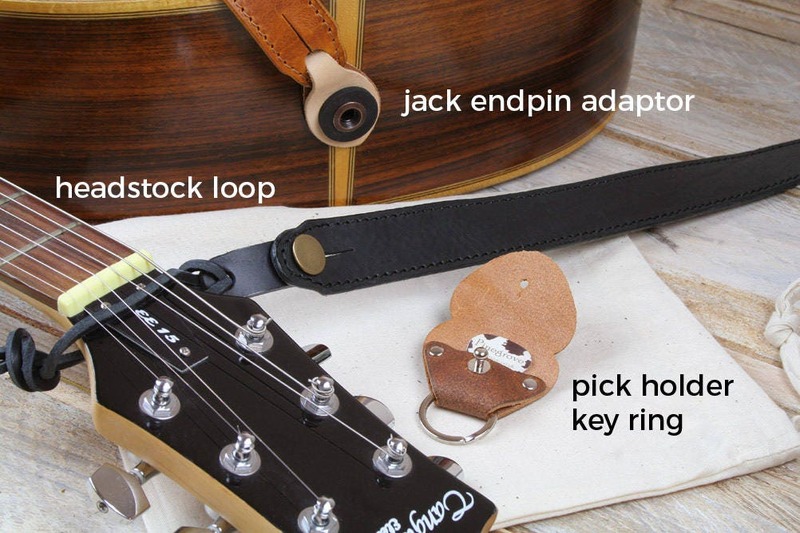 Add a note to your order if you require larger pin holes for strap locks. We will dispatch orders within 48 hours. If there's stock shortage, we'll let you know what's happening and give you the option to cancel. If you have paid using Paypal, and your Etsy and Paypal address differ, please let us know in the "message to seller" note during checkout. If you do not notify us and we cannot reach you within 48 hours after payment we will ship the item to the address provided during Etsy checkout. All items are sent via UK Royal Mail once your payment has been completed. Typically it takes 10 days internationally. Please let us know if you want insured or signed-for delivery. We will let you know the additional postage cost as soon as possible. We have not specified postage for additional items as this will be dependent on the size and weight of the actual items ordered. We will email you with the total cost after we receive your order. You will then be able to change your order if you want to. - Europe, including all of the CIS, Turkey and Georgia. - World Zone 1: Generally covers North America, South America, Africa, Arabia and most of Asia. - World Zone 2: Australia, New Zealand, Singapore and Pacific Islands. To calculate postage costs yourself, use http://www.royalmail.com/price-finder. In Step 1, select "Overseas". In Step 2, select "Small packet" and the weight value stated in the product listing. In Step 3, select "within 10 days" in the top box and "Less than £50" in the bottom box. Finally click "Find price". Price options will then appear below. From these, let me know which you want to use. "International Signed For" or "Airsure" is recommended. For all other postage types we will be able to provide proof of postage as a matter of course. Beware - your country may charge customs duty. This will not necessarily happen but we need to warn you it is a possibility and nothing to do with Pinegrove Leather. If you are concerned about this, please check out http://www.dutycalculator.com. If you are not 100% satisfied with your case then return it within 28 days in its original packaging for a full refund including the return postage costs or a replacement. Otherwise we expect it to last a long long time! See note below in Additional Information. Please note that leather is an organic material and has the naturally occurring marks of any genuine animal skin: this is part of its natural beauty. Where hair-on cowhide is part of the design, we have carefully chosen the pattern that will appear on every piece, and provide customers with options in terms of the balance of brown, white etc.